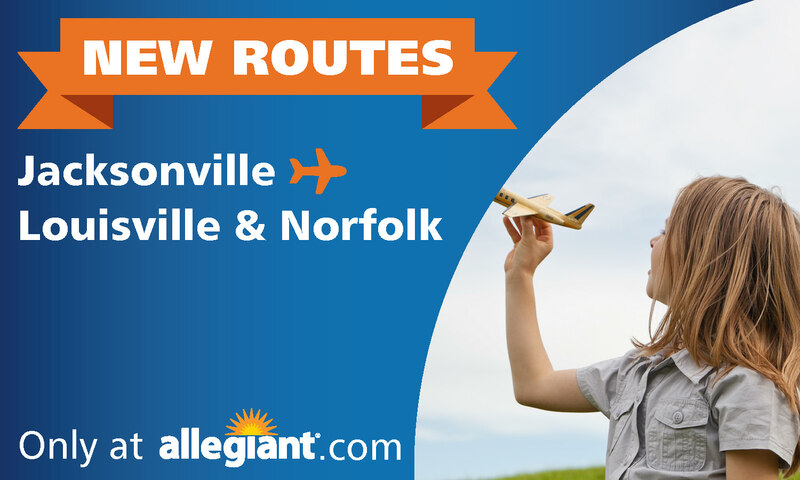 The new routes will operate twice weekly and expand on the service Allegiant currently operates to Jacksonville International Airport (JAX), bringing the total number of Allegiant routes to JAX to eight. The new flights will bring over 6,000 additional visitors to the area. Flight days, times and the lowest fares can be found only at Allegiant.com. Allegiant offers a unique option to Florida-bound travelers with low base fares and savings on rental cars and hotels. Travelers can book their entire vacation with Allegiant for less. Seats are limited. Price includes taxes and fees. Fares are one way and not available on all flights. Flights must be purchased by April 4, 2018 for travel by Aug. 13, 2018. 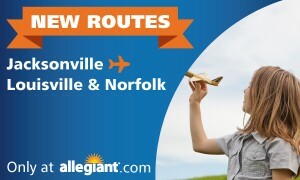 For more details, optional services and baggage fees, please visit Allegiant.com. Additional restrictions may apply.